InstaReM, the Singapore-headquartered FinTech startup offering convenient, fast and cost-effective digital international money transfers to individuals and businesses, has signed on Australian wicketkeeper, Matthew Scott Wade, as the sports face of the brand. Wade has been a stellar wicketkeeper-batsman for Australia, and a very dependable and resilient sportsman, having overcome cancer at the age of 16. Interestingly, InstaReM had modest beginnings in Australia, and has since successfully spread its wings to other corridors by obtaining the regulatory licenses in Singapore, Hong Kong, Canada, EU and India. Wade represents the Australian national team as wicketkeeper in all three forms of international cricket (Test, One-Day International, and Twenty20 International). He plays the domestic first class and list A cricket for the Tasmanian Tigers, as captain and plays domestic Twenty20 cricket for the Melbourne Renegades. “With cricket taking Wade around the world, he understands the need for a convenient and fast cross-border payment service; and is a perfect face of the brand,” adds Prajit. 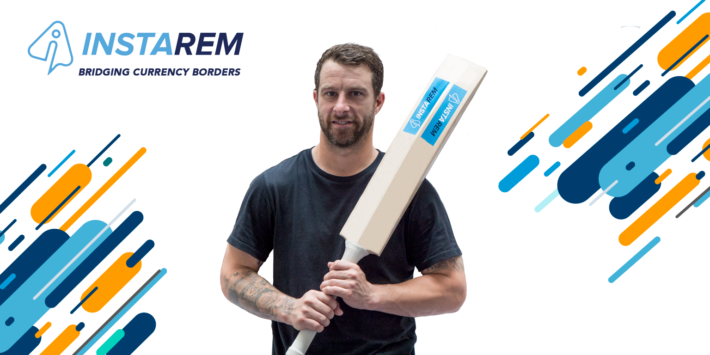 As a part of the agreement, Matthew Wade would be placing the InstaReM logo at the back of his cricket bat, which he will be using during his training sessions or at the times of matches till September 2018. Founded in 2014, InstaReM (short for Instant Remittance) is a Singapore-headquartered Fintech company that provides fast, secure and cost-effective digital cross-border money transfer services for individuals and businesses. The company is currently licensed in the European Union, Australia, Canada, Hong Kong, Singapore, and India. Businesses and individuals in these markets are able to remit money to over 50 countries worldwide. • In January 2015, InstaReM raised an initial US$500,000 from Rocket Internet. • In March 2016, InstaReM successfully raised a US$5 million Series A round led by Vertex Ventures, with participation from Fullerton Financial Holdings and Global Founders Capital. • In July 2017, InstaReM received another US$13 million investment Series B funding led by GSR Ventures, with participation from SBI-FMO Emerging Asia Financial Sector Fund, Vertex Ventures, Fullerton Financial Holdings, and Global Founders Capital.